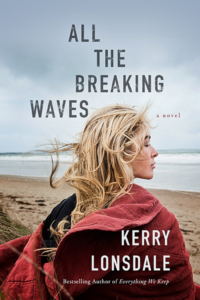 All the Breaking Waves starts with Molly contending with the aftermath of her daughter’s latest premonition. What sort of tone did this set for the story? Did you suspect Cassie would have a premonition about her mother? How did you think the book’s events would unfold? Molly clearly despises her extraordinary abilities. What do you make of her decision to not seek help for Cassie when her daughter’s abilities first manifest? What do you make of her decision to not help Cassie when Nana Mary asks that Molly show her daughter what Molly can do? Is her reasoning justified given the circumstances? Molly refers to sea glass as “trash turned into treasure.” How can that outlook be applied in Molly’s own life? What do you think of Molly’s confession about her father’s death? Do you think she’s to blame, or do you believe her father took matters into his own hands? During her argument with Nana Mary, Molly accuses her grandmother of comparing her to her father. In what ways might her father have influenced her? How else had his treatment of her affected her life choices? Whether it be impatience or miscommunication or simply the inability to “find the right words,” parents often assume one thing when children are expressing something else entirely. Should Molly have been more patient and understanding with her daughter? Or is Molly’s reaction to Cassie’s abilities understandable given Molly’s own turmoil and fears? Had Molly’s parents not died, how would Molly’s life be different? Do you think she and Owen would have ended up together? Would Molly have ever come to appreciate her abilities? When facing death, people choose to handle their impending demise differently. Nana Mary chooses to withhold the knowledge that she has cancer until she can no longer hide it. Do you think Nana Mary doesn’t want to burden Molly with the knowledge, as Molly thinks? Or do you think there are other reasons Nana Mary feels unable to discuss her sickness with Molly? Until the end, Molly never considers Cassie’s premonition could have been about anything other than her drowning. Were you surprised by the outcome? Owen was unable to save Enrique, the boy he wanted to adopt, but he does resuscitate Molly after she chokes. How do you think this will affect Owen’s internal journey? Do you think he’ll forgive himself for Enrique’s death? Throughout the story, Molly is faced with the decision to either embrace or shun her unique characteristics. How do Nana Mary and Cassie help or hinder Molly’s decision making? Many themes are presented in this story: acceptance, death, forgiveness, family, love, motherhood, and sacrifice. Which theme resonates the most with you? Which theme has the greatest impact on the story?